Samaritan’s Purse volunteers served a mother in Jacksonville whose military husband is deployed overseas. Katie Martin didn’t fear as she drove back to Jacksonville with her four children after evacuating ahead of Hurricane Florence. Katie’s husband is in the military and has been deployed to Afghanistan for nearly a year. She doesn’t have family nearby. Yet, after the storm, Katie’s focus was on taking care of others. Katie wanted to get her home, as well as her rental property, cleaned up as quickly as possible so that she could help assist other families. The Martins’ home has always been open for military friends to stay when they are in transition, and Katie wanted that to continue, especially after the hurricane. Katie’s rental property required volunteers to remove waterlogged sheetrock, insulation, and flooring. “I want people to have a place they can stay as long as they need. That’s my heart for our home. God has put us here to love others,” Katie said. Samaritan’s Purse volunteers removed lots of yard debris and fallen tree limbs in Katie’s yard. At her nearby rental property, where a military family was staying, our team tarped the roof and did a mud-out by removing waterlogged walls, sheetrock, and flooring. Katie is also grateful for the impact our teams made beyond physical help. Katie, 35, fiercely loves Jesus Christ and has continued to trust in His love and strength in the wake of Florence’s destructive aftermath. Despite damage to her homes and destruction throughout her community, she has faith that God is in control. Katie prays with Billy Graham Rapid Response Team chaplains. “This hard thing I’m walking through is a gift because it’s brought me closer to God than I could have been otherwise,” Katie said. Katie knows what it’s like to walk down a hard road. Her life was almost aborted, as her birth mother came within 12 hours of ending the pregnancy before a family member convinced her otherwise. When Katie was only 11, her adopted mother died and she moved in with her grandparents. But her grandparents discipled her, and one night when she was about 13, she came to faith in Jesus Christ after reading Psalm 139. In Psalm 139, Katie read God’s truth about how He created her and knew her before she was born. Katie is quick to tell her family, friends, and neighbors about the treasure she has found in her Savior. 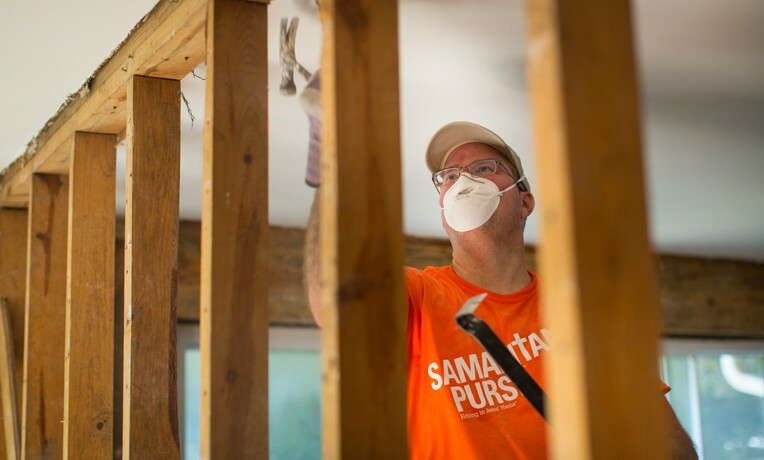 Samaritan’s Purse continues to work in six locations across North Carolina, South Carolina, Georgia, and Florida following Hurricanes Florence and Michael. From these locations, more than 7,000 volunteers have served over 1,700 families in need—mudding out flooded homes, tarping roofs, clearing fallen trees and spraying to prevent mold growth. We praise God that more than 200 homeowners have prayed to receive Jesus Christ as their Lord and Savior!